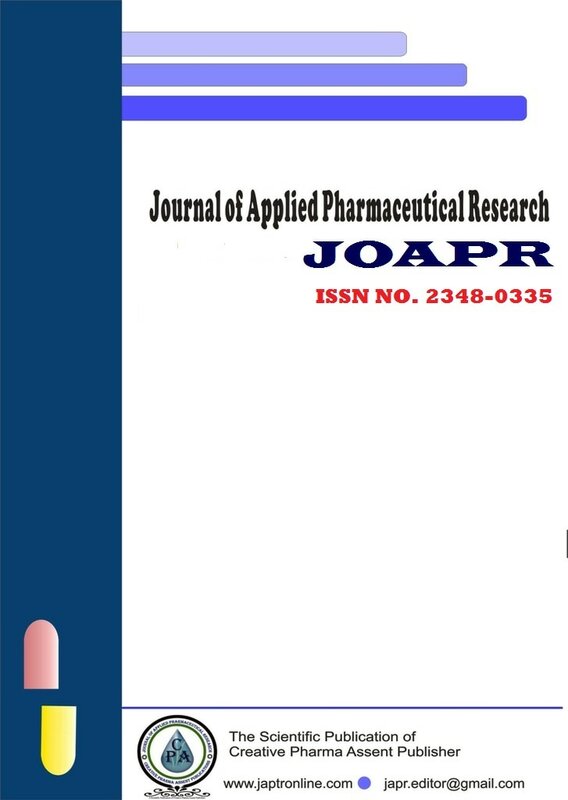 Journal of Applied Pharmaceutical Research (JOAPR) is an official publication of Creative Pharma Assent (CPA). It is an open access, peer review online international journal. JOAPR is primarily focused on multiple discipline of pharmaceutical sciences (Pharmaceutics, Pharmaceutical Technology, Biopharmaceutics, Cosmetic Technology, Pharmacokinetics, Pharmaceutical/Medicinal Chemistry, Computational Chemistry and Molecular Drug Design, Pharmacognosy and Phytochemistry, Herbal drugs/ formulations, Pharmacology, Pharmaceutical Analysis, Pharmacy Practice, Clinical and Hospital Pharmacy, Cell Biology, Genomics and Proteomics, Pharmacogenomics, Bioinformatics and Biotechnology of Pharmaceutical Interest) which publish quarterly. JOAPR also includes evaluation of pharmaceutical excipients & their practical application to research & industry based efforts. The aim of the scientific journal, JOAPR is to present a wide area for the current researchers to share their noble works and ideas in terms of the research papers, review articles and short communications. JOAPR only publish the original research works with a definite innovation and novelty after thorough reviewing. The paper must have a suitable and proper scientific background. We believe in fast review and publication of manuscript.